Saturday, millions of Americans will be anxiously watching and waiting to see whether a few undecided Republican Senators will vote to confirm Brett Kavanaugh as our next Supreme Court Justice. Their vote will help shape the Court for a generation. More importantly, their vote holds the potential to help Donald Trump further transform this country into an authoritarian, exclusionary democracy. Adolf Hitler did not seize power in a coup. There were no violent clashes between Storm Troopers and government forces, no storming of government buildings. He did not take the Chancellorship. It was given to him. On January 30, 1933, the German President and hero of the First World War, Paul von Hindenburg, appointed Hitler Chancellor in a Cabinet with just two other Nazis. The rest were nationalists of various kinds, but not National Socialists. Why is this important for us to understand today, in Donald Trump’s America? Because, among other things, it teaches us that the would-be autocrat cannot succeed alone. He needs help, and not just at the point of coming to power. 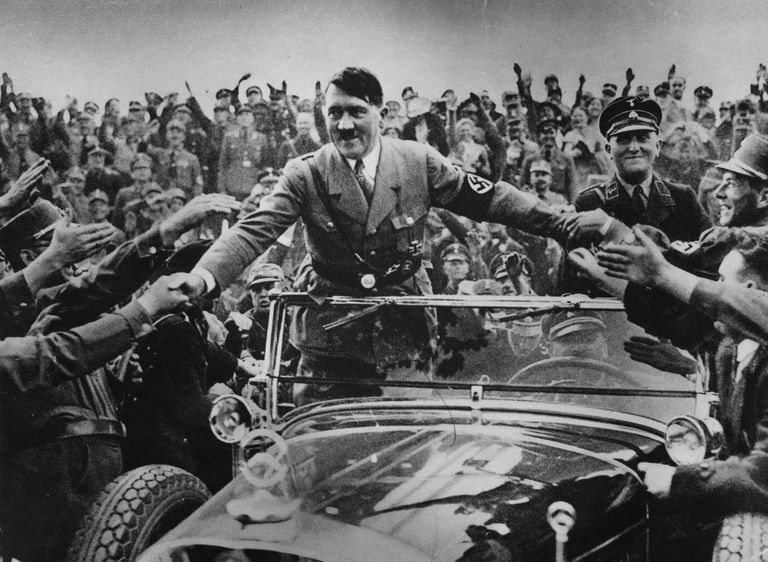 Hitler—originally the most improbable candidate to lead a country like Germany—became possible because much of the ground had already been prepared by others, many of whom were not friends of Adolf Hitler. People attacked the democratic republic from the very beginning, before it even had a chance to prove what it could do. Its leaders, they said, had stabbed the army in the back in 1918 and signed the humiliating peace treaty that followed. They were corrupt, under the control of Jews, robbing the country of badly needed funds. They were inept, unable to manage the economy and causing the disastrous hyperinflation that wiped out middle-class Germans’ savings in 1923. They were weak, unwilling to stand up to the Allies or fight the French troops that invaded western Germany that same year. They were weak on law and order, unable to control the violent street fights between Nazis and Communists in the early 1930s. And they had no answers for the Depression that racked the country at the end of its first decade. Extreme partisan divisions made the parliament less and less effective, and with the Nazi electoral breakthrough in September 1930, it was all but paralyzed. Whatever faith there had been in the system had largely evaporated, with the defenders of democracy limited almost exclusively to the Social Democrats. Hitler certainly played a part in this process, but until the Republic’s last few years, his was a rather minor role. In fact, it took the work of others to make it even possible for him to have the impact he ultimately had. After all, until the end of World War I, Hitler was a nobody, a failure, a man with no career and no direction in life. He needed a good deal of help. Fortunately for him, there were people willing to provide assistance. There were those like Ernst “Putzi” von Hanfstaengel, who helped make the “Bohemian corporal” socially acceptable in elite circles. There were those like the radical nationalist media mogul Alfred Hugenberg, who legitimized Hitler by including him in a major nationalist campaign. There were those who wore down Hindenburg’s resistance and convinced him to appoint Hitler. And there were those in parliament—all but the Social Democrats—who voted for the Enabling Act in March 1933 that gave him dictatorial powers. There were those who helped make Trump’s job of destroying liberal democracy that much easier before he’d even entered the political arena. Following Senate leader Mitch McConnell’s determination to make Barack Obama a one-term president, congressional Republicans committed themselves to pure and unadulterated opposition, working to block every single initiative he put forward. This involved the use of the filibuster with unprecedented frequency and the blocking of judicial appointments up to and including the theft of a Supreme Court nomination that was rightfully Obama’s to make. Then there was the undermining of the opposition party and in particular, its leader, Barack Obama. There was the extreme rhetoric used to attack him, including of course, the whole Birther movement—cultivated within the Republican Party—that claimed America’s first black President was not born in the United States and was therefore an illegitimate ruler. And related to that was the question of his faith. Was Obama really a Christian? Or was he, as many on the right suspected, actually a Muslim? Republicans questioned his patriotism, wondering aloud whether he really loved America. They said he was weak on (“radical Islamic”) terrorism. Maybe he sympathized with the terrorists? There were the posters depicting him in African garb, as an ape, and other racist imagery. Republican disrespect for the President was broadcast on national TV in September 2009, when Congressman Joe Walsh yelled out, “You lie!” as Obama delivered his State of the Union address. Then there were the attacks on his policies—attacks so over the top they smacked of pure hysteria, describing nearly apocalyptic dangers. The Affordable Care Act, they warned, would make America socialist, or communist, or Nazi. It established “death panels” that would decide who would get care and who would not. Presidential candidate Ben Carson called it the worst thing to happen in the United States since slavery and also compared the United States under Obama to Nazi Germany. Numerous Republicans compared the president’s plan to provide health insurance to more Americans to the Holocaust. Unfortunately there’s more than just the rhetoric and actions that have made Trump’s presidency a real possibility. There’s the astonishing lack of any serious criticism of him by members of his own party. They have expressed tepid disapproval at best, more often working to stall or block efforts to investigate and reveal the true dangers Trump poses. Where is the Republicans’ outrage, the disgust, at his racism, his misogyny, his attacks on the free press? Where are their demands to see his tax returns and reveal the corruption of his policies and his business relations? Where is their outrage over the fact that a hostile power intervened in our democratic process to help get Donald Trump elected? Where are their demands to know just what his relationship with Russia really is? Yes, Arizona Senator Jeff Flake has taken to the Senate floor to issue a relatively strong critique of the President from time to time, but the words were matched by the precise opposite of action. After his first such speech, he announced that his next move would be to retire! And the actions he did take—voting 85% of the time with Trump—rather weakened the force of his criticism. Right now he appears on the verge of once again saying one thing and then going right ahead and doing the opposite. Will he really vote against Donald Trump’s Supreme Court Nominee? His track record is not encouraging. And who else has there been within the Republican Party to state the situation even more strongly and to back up his or her words with action? Those who assist in the undermining of liberal democratic norms, who assist in the rise and success of the autocrat through acts of commission or omission, and those who fail to condemn him, especially those in positions of responsibility, who have influence, people who should know—all these people must be held to account. In Germany there were too many such people—people who were not Nazis—who undermined the democratic system, who actively worked against it, who voted for authoritarians, and helped Hitler into power. And once he was in power and quickly worked to realize his vision of Germany, there were all too many who helped, who denounced neighbors and co-workers, Jews and political opponents, to the secret police. There were too many who didn’t speak out against the lawless violence directed at German Communists and Jews. There were too many who didn’t speak out about these and other abuses while they still had the chance. Of course it’s true, no one knew just how little time they would have. No one knew if Hitler would be Chancellor for long. No one knew that the Reichstag would burn. No one knew all the horrors that were still to come. Nobody could know. But that’s precisely the point. No one can know what’s just beyond the horizon. But what we do know is that once that window of opportunity closes, it’s too late. That’s why the time to speak, the time to resist, is now. We’ve already had more time than the Germans did in 1933. Let’s not squander what remains in the misplaced hope that it can’t happen here.